My name is Anthony Satori, and I am an artist and photographer from southern California. I believe that artwork enriches the spirit and the mind, and that it enhances the quality of our lives. This is why I have created this blog about art and culture: to share my work with you, to celebrate the creative life, and to reflect on the world we live in. It will feature many kinds of images and writing, from the philosophical to the light-hearted, and hopefully you will find it to be a place of enjoyment and inspiration. If you seek beauty, positive energy, and illumination, as I do… come around and be a part of my Circle. If you’d like to be notified whenever I post something new, please feel free to follow this blog by clicking “follow” in the right-hand margin. You can also follow me on Twitter @SatoriArtist. If you are a musician, author, etc., in the southern California area, I am available on a limited basis to shoot promotional/editorial images for actors, models, musicians, authors and other creative people. Work can be done on location or in my studio. If you are interested, please feel free to contact me using the form below. Show the world how amazing you can look. Anthony Satori is an artist and photographer from southern California. His artwork has been exhibited and collected around the world, including gallery shows in London, Vienna, Shanghai, Germany, Switzerland, Santa Fe, San Francisco, Los Angeles and New York City. Satori’s fine art imagery has received numerous awards and recognition from such prestigious organizations as the International Photography Awards, PX3 (Paris), the Moscow Foto Awards, and Hasselblad, which sponsored two separate international photography tours featuring Anthony Satori’s fine art photography. In the field of fashion photography, Anthony Satori has worked with models from major agencies such as Ford, Elite, Wilhelmina and Nous, and has photographed models from around the world including Italy, Germany, Brazil, Nigeria, Romania, the United States and South Africa. 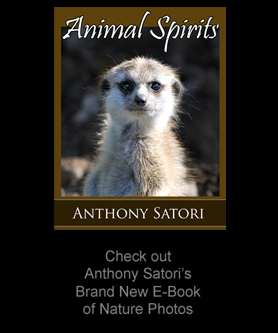 Anthony Satori’s photographs have been featured in national magazines such as Direct Art, Photographers Forum Magazine, and Detour, and his imagery been published in several books, including Electric Rain, Incredible Eyes, the hardcover monograph Pretty Girls (featuring poetry by Nobel Prize winning poet R. Tagore) and most recently, Animal Spirits, a monograph of Anthony Satori’s nature photographs. Anthony Satori’s original artwork can be found in numerous private and museum permanant collections around the world, including New York’s Museum of Modern Art, The Boston Museum of Fine Art, The Getty Trust in Los Angeles, and Il Associazione di Promozione Sociale Artetica in Rome, Italy.